Russet Street Reno: I've been featured! 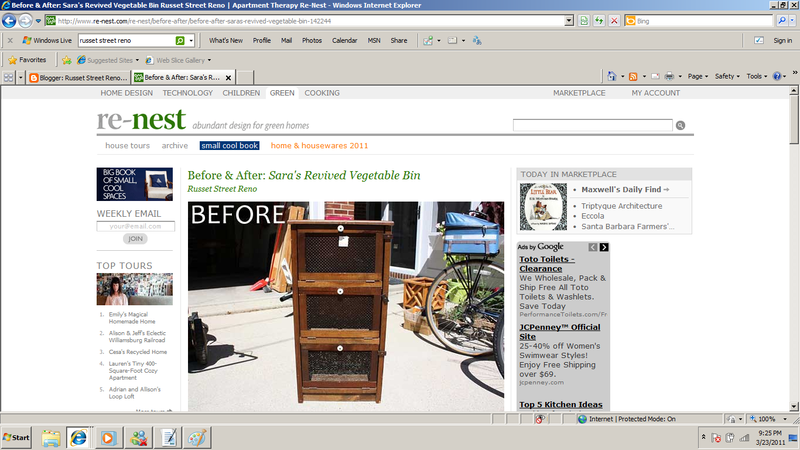 Hey, I just found out that Re-Nest posted about my veggie bin makeover. I had no idea until I got an email from a lovely new reader. Check it out here! YAY Sara! You deserve it chica! Yay how awesome it that! Awesome! That's so great! You deserve it. I have been enjoying your blog for several weeks now and figured I better leave you a comment so I can stop feeling like a creepo stalker. Very fun blog. I am your neighbor to the west. I live over in Minneapolis. Keep inspiring! And from one bride-to-be to another--happy wedding planning!